Merlot is an upstairs room. Being our largest, you will find it spacious and private. Its windows overlook the backyard garden. 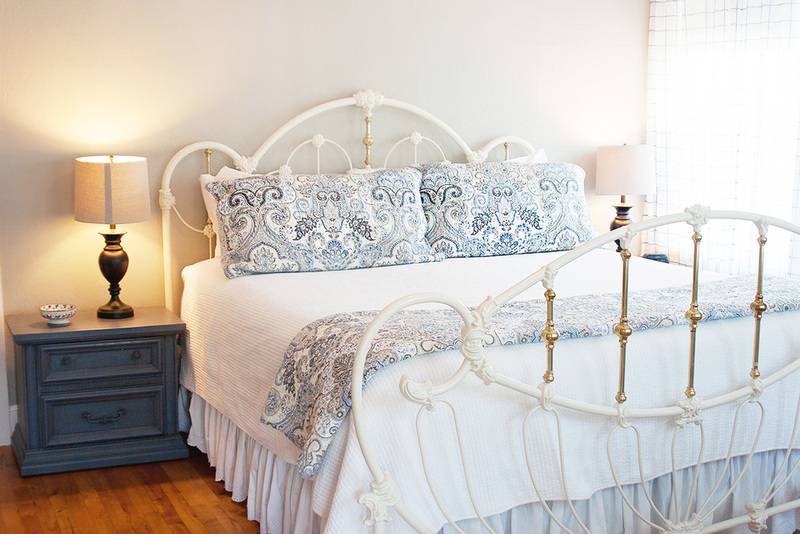 With its white iron bed with its luxurious white bedding and strikingly blue accents set against warm gray interior walls. This room has a beautiful crystal light fixture that emits soft evening light with beautiful sparkle patterns across the room. Its large private bath is tucked into an attic space with all the character and charm of the early 1900’s with all the modern convenience of a large glass walled shower. Excellent time with Adrian and Steve. Room was spacious and bed was amazingly comfortable! Bathroom had everything we needed (shampoo, conditioner, hair dryer). We were given a bottle of 7 Zins (Michael David) along with a plate of cheeses when we arrived which was so appreciated! Breakfasts were delicious and very filling yet healthy. Location was great and an easy 5 minute walk to School Street where there were many nice restaurants. We dined at Lodi Beer and also Rosewood. The backyard is so beautiful and a great place to eat breakfast or sip wine in the evening. We visited many wineries but our favorites were Oak Farm, Jessie's Grove, and Viaggio. Our favorite wine was Michael David. Would definitely stay here again! Lovely bed and breakfast residence within walking distance of Lodi town centre. Beautiful rooms with all expected amenities. Very clean and tidy and the house itself is gorgeous, very classy decor. Breakfast was fab! Excellent quality of food, freshly prepared. You eat around a large table so it is a good time to chat with other guests if you wish and find out other interesting places to see in and around Lodi. Met at agreed time with Adrian and both Inn Keepers were very pleasant and professional. Would definitely stay there again if visiting Lodi. One of the highlights was hanging out on the front porch chairs relaxing. We ended up meeting the neighbors (doing the same thing) who joined us with a few bottles of wine to try. We are now planning to return and bring more friends this time.